Set on a high cliff with breath-taking views and surrounded by nature, Can Pau is the perfect place to unwind while taking in the spectacular coast of La Mola and beyond. This rustic eco unique casita is fully solar powered (with batteries for night), and provides a welcome respite from the busy world, as it has no tv signal or mobile phone reception. It blends in amongst the pine trees and rosemary bushes, making it feel part of the landscape, bringing you closer to nature. Located down a long winding road, you will find a very private Can Pau. Set away from other houses, this casita provides unprecedented access to nature with miles of walking trails along the cliffs and many coves waiting to be explored along the rugged and beautiful coastline. This place will rejuvenate your soul. On the upper level is the entrance into the spacious living/ dining room, equipped with a TV and DVD player if you feel the need to watch a movie at night, or tune in to one of the many international radio stations. Then through the sliding doors onto the amazing terrace with panoramic sea views. The perfect place to while away a hot summers a day, taking in the views and drinking cold beverages. The bijoux kitchen is charming and very well thought out, making a very practical space a pleasure to cook in. To the lower level there is the bedroom with sliding door leading to a lovely private terrace area, and bathroom with toilet and shower leading through to the outdoor shower area. You will feel at one with nature showering in this unique and private space. This fantastic Formentera sea view villa has spectacular 180 degree panoramic vistas across the mediterranean and La Mola coastline from its large terrace. It is a fantastic area for dining al fresco and watching the world go by (boats and birds mostly), listening to the wildlife, and watching the stunning sunsets. It also has a separate rustic patio area, with plenty of room to hang a hammock, and with 360 degree views of the countryside and the cliffs cascading down to the turquoise waters below, is an excellent area for chilling at any time of day. This casita is located 2km from La Mola centre with its many bars, shops & restaurants. 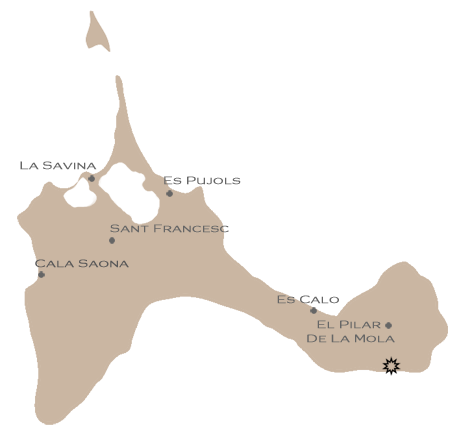 The nearest beach is Es Calo or Platja Mitjorn approximately 10 minute drive away at the bottom of the hill. There is a spectacular walk from La Mola to Es Calo (Cami de sa Pujada) that cannot be missed. "Thank you very much. Our time in Formentera was absolutely amazing, we love it out there ! The location of Can Pau is really incredible ! We loved it ! The dirt road to get to the house is quite an adventure ! The house has an amazing view and we really enjoyed that. Pablo is very nice and we enjoyed his company very muc"
"We had a fantastic time at Can Pau. This spot is truly breathtaking and unique, we could fully relax and were so happy with everything. We had a car with no high clearance and the drive down to Can Pau was truly adventurous. After two days we parked the car a bit higher above, because the last 300 meters were the worst. But the walking was no problem for us. We will be back and this is the proof that Can Pau is great! Thank you for your superbe service. I highly appreciated it"